The ImagePRO-HD is a high-performance video scaler, scan converter, switcher and transcoder all rolled into one. ImagePRO is the ideal solution for converting RGB, HDTV, component, s-video, composite (NTSC, PAL and SECAM) and HD/SDI video into a user-selectable video format. 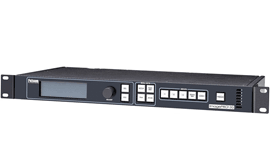 The ImagePRO includes four video outputs and three universal inputs, as well as a dedicated genlock BNC connector with loop-through. ImagePRO-II is the most advanced and flexible signal processor in the industry.